Weighted blankets used to cost a ton of money and were sold only by companies dealing with products for children and adults with special needs. This year, weighted blankets were added to retail stores across the US. 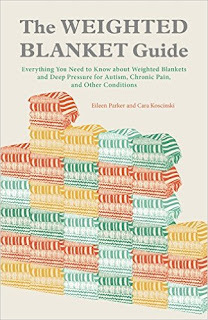 As the co-author of the Weighted Blanket Guide Book, I did a great deal of research on weighted blankets. In my book, the benefits and risks of weighted blanket use are discussed. Also, we give a how-to guide about making your own blanket. Did you know that weighted blankets have NO official research to confirm their benefit in children with autism and sensory processing disorders? The only research on the blankets was completed by an Occupational Therapist (OT) on adults in mental health units. 1) Weighted blankets are used for adults and children. In fact, they are used by many with chronic pain, stress disorders, autism, sensory processing difficulties, ADHD, fibromyalgia, and so many more. They have been used in hospitals for years and their popularity is growing. Simply put, they are blankets with weight distributed evenly within pockets or sections sewn into the blanket. 2) What types of things are put into the blankets for weight? Many items can be used such as sand, rice, beans, and seeds. The problem with these items is they cannot be washed. In my book, The Weighted Blanket Guide, we discuss and provide instructions for making your own weighted blankets! Our recommendation is to use poly-pellets so that they are washable and are non-organic and cannot sprout. 3) Is there a right or wrong weight? NO! There is no proven research study that was able to be replicated that confirms or stats an exact weight for the blankets. This is why there is so much confusion surrounding the weight of blankets. The best way to start is to use a person’s weight. So, 5-10% of a person’s body weight is the current suggestion. I recommend using the least possible weight for a person in order to determine IF a weighted blanket will even work. NEVER use a heavy blanket on a person who is under three years of age OR is physically unable to remove the blanket. 4) Will a weighted blanket work for my child? The awesome thing is that when someone responds to a weighted blanket the results can be LIFE-CHANGING! I recommend trying a weighted lap pad or heavier comforter at first to see if you/your child responds to weight. Some children respond so well to the blankets and they are an awesome, medication-free way to provide help and comfort! I spoke to Temple Grandin about weighted blankets and the use of tactile pressure. We agreed that the blankets work for many people but others kids don’t respond. The awesome thing is that when a blanket works, IT REALLY WORKS! Children and adults have reported better concentration, increased sleep, increased calmness and focus, decreased pain and overall feelings of well-being when using weighted blankets. They are worth a try! 5) Is there a right or wrong way to use the blankets? Again, since there have been SO specific confirmed and replicated studies on weighted blanket weight and use (don’t worry, many of us are working on researching this), there is no ‘official’ standard on the way to use the blankets. The general consensus among occupational therapists is to use the blanket when resting, when stressed or needing calm-down time, and/or during sleep. There is no wearing schedule such as time on vs. time off. NEVER use a weighted blanket on an infant or child under three. Never use a blanket on someone with wounds or who cannot independently remove the blanket on his/her own. ALWAYS leave the head out so the child/person can breathe. As with any therapeutic intervention, consult your child’s physician or medical professional before beginning any therapy program or trying any new equipment. Please read my disclaimer here.